The Ministry of Environment & Forests (MoEF), Government of India circulated its draft guidelines for 'E cotourism in Protected Areas'. While in principle it is necessary to have guidelines in place to regulate and mitigate pressures of tourism on all Protected Areas in India, it is important that a more pragmatic and positive approach needs to be adopted by the Government. Being a former member of the National Board for Wildlife and an ardent wildlife conservationist and a wildlife chain resorts operator, I feel there are severe short-comings which I would like to highlight below. The MoEF's suggestion that 30% 'local conservation cess' be paid by all resorts and commercial properties within a designated zone around a Protected Area (PA) is totally unworkable. The Banerjee Committee Guidelines of the 28th May 2011 suggests Lodges and Camps pay a fee to the host community. However, the MOEF's guidelines have diverted this to a fee for themselves! We feel that instead of a 'local conservation cess', the government should enforce strict guidelines wherein the resorts around the PAs should contribute for the betterment of local communities, environmental awareness and wildlife conservation. They should have a choice of either donating this funds towards the Foundation formed in each tiger reserve and claim 100% tax exemption, OR if they prefer, direct these donations to the villagers at the grassroots level. For e.g. solar energy to provide renewable energy, removing of weeds/invasive species from wild habitats, veterinary care services, compensation for livestock killed by wild predators, recharging ground water by rain-water harvesting, helping villagers in income-generating schemes etc. The Corbett Foundation (TCF), which was established by me way back in 1994, works with the objective of mitigating man-animal conflict and ensuring that human beings and nature share a harmonious relationship. TCF together with Infinity Resorts (IR) which owns a chain of wildlife resorts in Corbett, Kanha, Bandhavgarh, Kutch and Kaziranga have been doing the above programmes since its inception 20 years ago. Our staff interacts with tourists and educates them about the need and importance of low-impact and responsible tourism. Many tourists also participate in the Foundation's wildlife conservation and environmental awareness initiatives in all our divisions. TCF (Kanha) also operates a Medical & Training Centre in Infinity Resort's property in Kanha that regularly imparts vocational training to the local tribal youth to provide them alternate livelihood opportunities. As for the guidelines which classify all those with a business stake in ecotourism as apathetic to environmental concerns - I totally disagree to this statement! The ecotourism industry is dependent on tourists that come only to see and experience the forests, wildlife and wilderness of the PAs. The hoteliers cannot afford to be apathetic to the environment because if the wildlife, forests and environment are destroyed, it will affect their business negatively. When I founded The Corbett Foundation more than 17 years ago, it was because I felt strongly that the local communities living in the periphery of these Pas need to be involved in the mainstream tourism and should reap the benefits of tourism directly. This, I believed, would ensure a viable business proposition and long-term survival of wildlife a “win-win” solution which has been carried out very successfully in Africa. TCF, through its work in wildlife conservation, environmental awareness, community medical outreach, vocational training, habitat restoration, and sustainable development initiatives has demonstrated a model which can be replicated by other players in the ecotourism industry. But such initiatives must be recognized and encouraged by Government. Ecotourism initiatives abroad are encouraged by incentives like Green Awards. It is high time that Government encourages and institutes national-level awards for ecotourism stakeholders. Government schemes / initiatives must put Ecotourism as one of the areas that the corporate sector can support as part of Corporate Social Responsibility (CSR) incentives. The corporate sector should receive tax incentives for supporting ecotourism projects. I would also like to draw your attention to the tourist infrastructure created and managed by Government, either as Forest Department or Tourism Department, inside PAs. The obvious examples are Dhikala Tourism Complex inside Corbett Tiger Reserve, The ITDC Forest Lodge inside the Keoladeo National Park at Bharatpur, RTDC Jhoomar Baori on the edge of Ranthambhore Tiger Reserve, MPTDC Bhageera Loghuts in Kanha Tiger Reserve and the KTDC with Aranya Niwas and The Lake Palace inside Periyar Tiger Reserve. It would be interesting to know how much revenue each of these properties generates for the host park per annum and how much has been ploughed back into the conservation programmes of these parks? In addition, will the government levy Conservation Cess on these properties as well? What about Forest Rest Houses in many PA that are rented out to tourists? Most of these are situated deep inside the core areas. Does the government plan to move these accommodations out of the core areas? The Park Directors are busy running these FRHs instead of using their valuable time for forest and wildlife management! There is hardly any enforcement of strict rules and regulations inside the PAs, as well. A striking example is Jhirna Forest Rest House in Corbett NP that has been converted into a canteen for tourists. It serves snacks in non-biodegradable packaging, there are no sufficient waste bins, and foil and polythene bags are littered everywhere. One can see so many rhesus macaques and common langurs feeding on these leftovers even in Dhikala and Bijrani zones of Corbett NP. It is a common knowledge that there are many villagers who enter the PAs illegally to cut wood, poach, set up traps for wildlife, cattle graze, collecting minor forest produce, etc even from core areas. The Forest Department personnel should stop these trespassers as they affect the wildlife and their habitat! The guidelines propose to allow only 10-15% of the area of a PA for tourism. The draft guidelines also say that ecotourism will only be conducted in buffer areas instead of in core zones. As everyone knows, buffer areas in most PAs do not have a high density of wild animals and therefore the possibility of sighting wildlife is less. As the rates for entrance fees are raised yearly, so are the possibilities that many tourists will complain that they have travelled from afar and due to poor animal sightings, this tourist inflow will definitely be affected negatively. This in turn will affect employment, demand and business opportunities to thousands of local community stakeholders. Another eye sore is that as per the Indian laws, grazing by cattle and collection of minor forest products are allowed in the buffer zones of PAs. One can see huge herds of domestic cattle, buffaloes, goats, etc in buffer zones of many PAs including the high profile Corbett, Kanha, Bandhavgarh, Ranthambhor, etc. that are classified as tiger reserves! I wonder if the Government is proposing that 'eco tourists' be content with seeing thousands of domestic cattle grazing in the tourism zones, when they have travelled so far to come to view Indian wildife? Does the Government have any back up plans to ban cattle grazing and collection of minor forest products by local communities in buffer zones as they compete with herbivores for the same habitat? There seems to be no coordination and control between the departments within each State and with other States. While MoEF is trying to control tourism in PAs, the Revenue Department is happily allowing the mushrooming of resorts along the fringes of these PAs. With less number of safari vehicles allowed in future, what purpose does it serve to approve business investments in more or excess tourist infrastructure around these PAs? This is a classic example of bad planning, poor management and right hand not knowing what the left hand does! Finally, I strongly feel that the task of drafting 'ideal' ecotourism guidelines for all PAs in India is impractical and will turn out to be a pursuit in futility. Instead, MoEF should appoint a committee comprising of multi-stakeholders to look at site-specific ecotourism guidelines. For e.g. 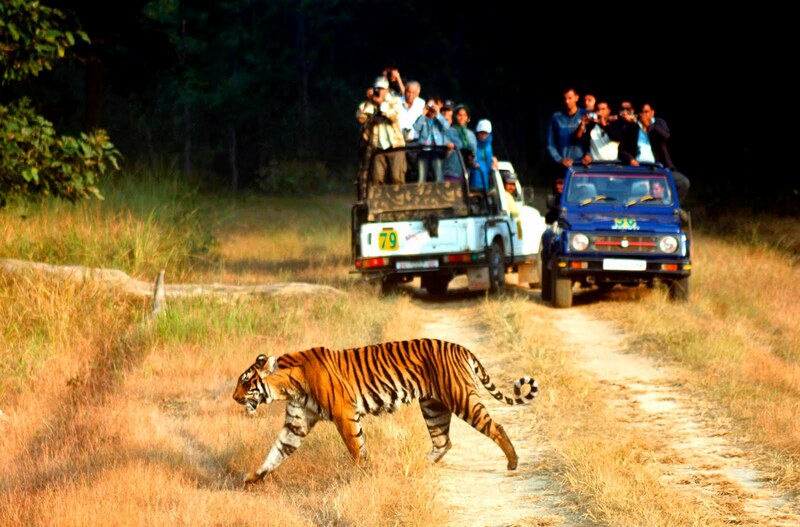 what may be good in Kanha Tiger Reserve may not be appropriate in Periyar Tiger Reserve. Buffer zones should be utilised for activities like bird watching and nature walks, conducted under strict supervision and only in certain areas. Ultimately, controlled wildlife tourism will discourage poachers and raise awareness that the forest and its resources are sacrosanct! Hopefully, with more funds earmarked for Project tiger in the coming years, the future will look brighter for tigers in India! Nice Post. Thanks for sharing the information. I have bookmarked your post. Looking forward for more posts.